The company founded in 1994 at Kanpur, Uttar Pradesh, was founded with the objective of manufacturing and export of leather and goods made from leather. Initially, the company manufactured leather saddlery & harness goods with the help of technical assistance provided by Horse riding group in Germany. Now, the company is involved in manufacturing and export of leather shoes and saddlery goods, wholesaling, distribution as wells as the retail business of basic footwear. The company is also engaged in services of leather shoes and trading of leather chemicals at domestic level. The retail business of the company, which caters to the middle and upper-middle income people, is conducted through exclusive retail stores and the distribution business, which caters to lower and middle-income people, is carried out by a wide network of distributors. The company focuses on the quality of products and is ISO 9001:2008 certified for a wide range of products like goods, footwear and accessories made of leather, riding apparels, horse rug, dog covers, etc. The registered office of the company, factory for production and tannery are at Kanpur in Uttar Pradesh. The company is coming up with an IPO in the next few days and in this detailed review, we will have a look at different data points and see whether you should be investing in the AKI India IPO or not. Currently, there are 5 Directors on the Board of AKI India Limited. Osama Anwar Iraqi is the Whole Time Director of the company. He is a Commerce Graduate and possesses an experience of 5 years in overseas operations related to the marketing of the company. He is also responsible for supervision of the production function and day to day operations of AKI India Limited. AKI India IPO will open on 28th September 2018 and close for subscription on 3rd October 2018. The IPO size will be of 28 lakh Equity shares and the face value of each share will be ₹10. The fixed price has been set at ₹11 per share. The offer price band includes a premium of ₹1 and is 1.1 times the face value of the equity shares. The IPO size is expected to be up to ₹308 lakhs or ₹3.08 Crore. Out of the 28 lakh equity shares, 1.4 lakh equity shares, aggregating up to ₹15.4 lakhs will be reserved for market makers and the rest 26.6 lakh equity shares, aggregating up to ₹292.6 lakhs will be issued to the public. Out of these 26.6 lakh shares, 13.3 lakh equity shares, aggregating up to ₹146.3 lakhs will be allocated to retail investors for up to ₹2 lakh. The market lot size is of 10,000 equity shares and the shares will be listed on the SME exchange of the Bombay Stock Exchange (BSE). Pursuant to a resolution passed on December 9, 2017, the issue has been authorised by the Board of Directors and pursuant to a special resolution of the shareholders at the Extraordinary General Meeting held on December 15, 2017, the issue has been approved by them. The revenues of the company have been increasing gradually and consistently over the last five years. They showed an increase from ₹1541.05 lakhs in the financial year ended March 31, 2014, to ₹4536.26 lakhs in the financial year ended March31, 2018 representing a CAGR of 21.94% on consolidated financials. There has been a sudden increase in profit after tax in fiscal 2018 to ₹102.22 lakhs from ₹15.11 lakhs in fiscal 2017. Earnings per share also increased from ₹0.76 to ₹1.36 during the same period. The return on net worth of the company for the years ended March 31, 2016, March 31 2017, and March 31, 2018, is 4.79%, 2.28% and 13.37% respectively. Other than the above-mentioned objectives, the company will also benefit in terms of enhanced corporate image, brand name and increased visibility through AKI India IPO. 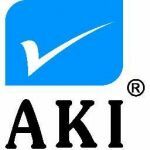 AKI India Limited filed the Draft Red Herring Prospectus (DRHP) with the Securities and Exchange Board of India (SEBI) on September 10, 2018, for the Fixed Price IPO. The offer will open on 28th September 2018 and close on 3rd October 2018. The finalisation of basis of allotment is expected to happen by 10th October 2018 and the initiation of refunds is expected to start by 11th October 2018. The transfer of shares to demat accounts is expected to start on 12th October 2018 and the expected listing date will be 15th October 2018. Finshore Management Services Limited is acting as Book Running Lead Manager to the issue. Link Intime India Private Limited is acting as the Registrar for the AKI India IPO. Now, let us analyse some of the key strengths and risks related to the business of AKI India Limited before deciding whether to invest in the IPO or not. One of the biggest strengths of the company is its highly experienced promoters and management team because of which the company is able to take advantage of current as well as future opportunities. Also, they are benefitted by a strong and skilled workforce. The company has been able to establish itself as a strong and trusted brand in Uttar Pradesh over a period of years. AKI India Limited shares good relationships with its customers. Major customers of the company have been associated with it for around 5 years. Also, the company is benefitted by the easy availability of raw material for their products i.e. raw hide. It is in vast abundance across the country and especially in Kanpur where the company is located. AKI India also has modern slaughterhouses. The company also has good strategies for expansion of their operations geographically and enhancement of their brand name which look promising. Now, let us discuss some of the risks related to the business of AKI India. The company’s promoters are involved in certain legal proceedings and any adverse ruling in them may pose a risk to the overall operations and profitability of the company. Another big risk factor for the company is intense competition in the leather manufacturing industry which is a threat to the market share of the company and may have negative effects on the results and profitability of the company. Some peers are bigger than the company in terms of business volume and smaller players pose risks in terms of cost competitiveness. The revenues of the business are dependent on certain major domestic and overseas customers and any loss of those may have a negative impact on the financial health of the company. The company has shown negative cash flows in the past and if it continues to be so, it may affect the future profitability of the company because cash is required for working capital requirements, expansion purposes, payment of dividends, etc. The operations of the company are mainly focused in Kanpur which exposes them to a risk of reduced profits in case they fail to expand geographically or penetrate in the existing market. Failure to maintain relationships with third-party distributors may affect the distribution business of the company adversely. The nature of the business is such that it requires some statutory and regulatory approvals and if the company fails in obtaining them or retaining or renewing the existing ones, it may negatively affect the operations and overall financial health of the company. The activities conducted in the manufacturing process are dangerous and can cause injuries to workers due to which a significant disruption in the facilities could happen which may result in adverse effects on costs, schedules and sales. The rise in profit after tax in fiscal 2018 as compared to fiscal 2017 is sudden and disproportionate to the rise in revenues during the same period. This is a cause for concern. After analysing various aspects of the company, it can be said that investors should remain cautious and can subscribe to the AKI India IPO.